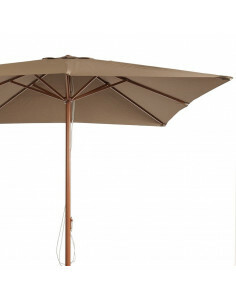 2×3 m. Aluminium parasol with wind exhaust.Fabric: 230 gr/m². Polyester (beige colour) and 100% acrylic as an option. 3x3m white laquered aluminum structure. Waterproof polyester weight 220 g/m2. 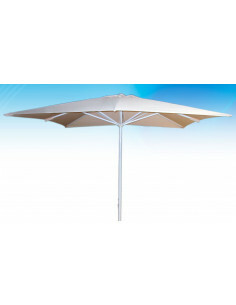 SUN UMBRELLA AM1 Square aluminium umbrella 3x3 m and 2.70 m high. Pole of 580 mm of diameter in wood colour finish. Eight ribs 18x28 mm in wood colour finish. 300 g/m2 polyester fabric in natural colour without "flap", with airshaft and impermeability tratment. Plastic pole system. 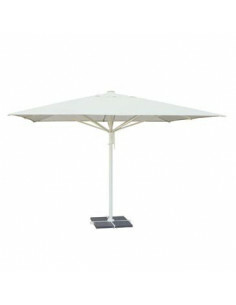 Powder-coated aluminium square umbrella in white, 3x3 m (9.75x9.75 in). Eight ribs 20x30 mm. Double pulley. Single-piece pole, diameter 50 mm and 1.50 mm thick. Polypropylene hub and runner. Waterproof polyester weight 220 g/m2. High quality lateral umbrella ref.FLEXO. Aluminum structure (mast and rods) painted in white or black color. Size: 3x3m, tube: 65mm diameter. Ability to customize with logo. Made in Spain with fabric 280gr Acrylic available in 4 colors. Delivery in 3 weeks. Comes with foot spider. 100kg cement. base optional. 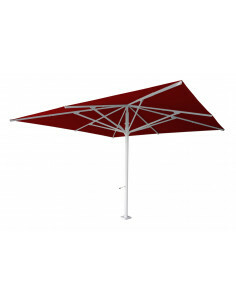 Powder-coated aluminium square umbrella in different colors, 3x3 m. With aluminium frame and ribs; 20x35mm. Sun umbrella with crank system. Pole 71x71mm . Fabric: Waterproof polyester or masacril (acrilic) weight 300 g/m2. Option: courtains for wind stop. 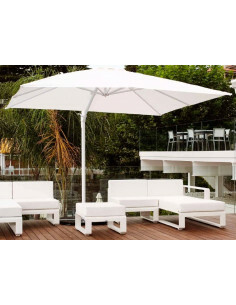 TOP MASTER square parasol 4x4m with all the accessories to adapt the terrace of your place: parasol in raw polyester fabric or acrylic fabric (colors to choose), which can be mounted as an option the side curtains and the channel for collect water (to place between parasols). 1 354,83 € tax excl. 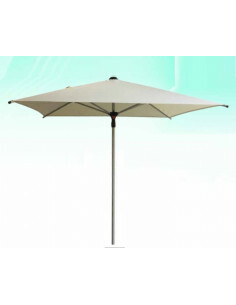 TOP CONTRACT GIANT square parasol 5x5m in raw polyester fabric or acrylic fabric (colors to choose) with fix base included. Opening with crank and rods with double reinforcement in the joints. Base to attach to the floor included. Base to fix to the included floor (fixation in surface). 2x2m white laquered aluminum structure. Waterproof polyester weight 220 g/m2. Hood tilt redonbdo, 2m in diameter in order to adapt the terrace of a local bar or restaurant: hood in polyester fabric ecru. See base optional game. Aluminum mast, white in color. 2×2 m. Aluminium parasol. Polyester fabric: · 250 gr/m² in beige colour. (or, as an option in acrylic Masacril Soft fabric surcharge). Aluminium pole and ribs. Optional flap (surcharge). Aluminum parasol of 2.5 x 2.5 meters. 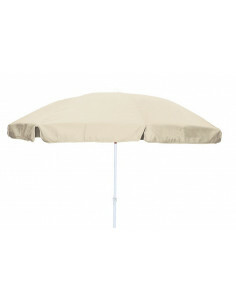 The sun umbrella is offered in sand color, but can be ordered in a wide range of colors. No valance. (Valance as an option without extra cost). With airvent. Base as an option. 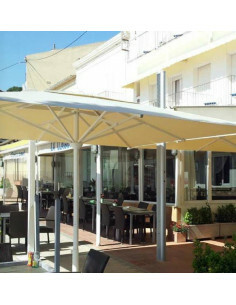 Parasols for terraces of restaurants, bars, swimming pools, beach. Round, square and rectangular umbrellas. Wide range of products with different structures that adapt to the needs of the client: from the individual 2 meter sun umbrella to the professional 4 meter parasols with reinforced structures to place courtain lateral screen and watter channels to obtain a clean and homogeneous set. 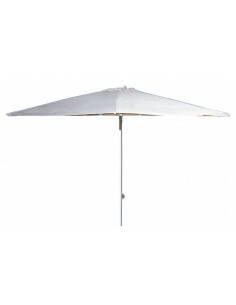 In general, we have the parasols in stock in resin-white colored polyester fabric. We have a workshop for the manufacture of parasols in the rest of fabrics: polyester or acrylics in different colors and qualities. Movable or recessed parasol bases. 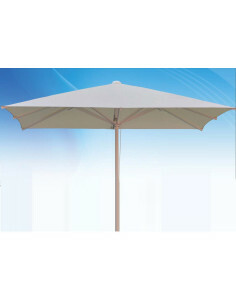 Parasols with flap as an option, with the possibility of customizing the flaps with a logo. From 1 unit. Accessories for sunshades: outdoor curtains & screens of 2, 3 and 4 meters long.